Actress Sophie Turner was born on February 21, 1996 in Northampton, Northamptonshire, England, the daughter of Sally, a nursery school teacher, and Andrew, who works for a pallet distribution company. She moved from Northampton to Warwick, England with her family as a child. She has two brothers named James and Will. 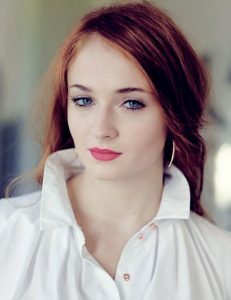 She is best known for her role as Sansa Stark on the HBO fantasy television series Game of Thrones, which earned her a Young Artist Award nomination for Best Supporting Young Actress in a TV Series. She has a perfect body which measures breast 34, waist 24 and hip 34. She has a height of 5 feet and 9 inches which is around 175 cm. She wears a size 8.5 shoe and her zodiac sign is Pisces. *She is a huge fan of Jack Nicholson. *Besides being an actress, she’s also a model. *She modeled for Karen Millen’s Fall 2014 Campaign. *She had her first big screen role in the 2013 film Another Me.